BY D. GORDON LANCASTER. 1937. THESE tentative notes relating to the Ngoni are the result of many years of research amongst the natives in the Eastern Province of N. Rhodesia, with whom I have been in constant contact, firstly as a Government official and secondly as a friend. I have received the greatest assistance and courtesy from the Paramount Chief, Mpezeni Jere II, and I am further indebted to A. K. Jere, a son of old Chief Kapatamoyo Jere, without whose knowledge, assistance and tactful handling of the old indunas these notes and genealogy would never have been completed. 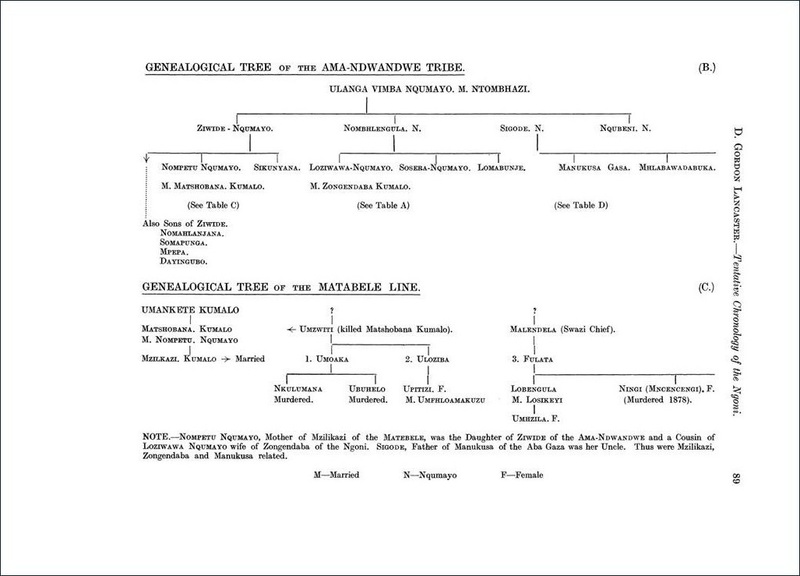 (1) Zongendaba (Zwangendaba, Uzwangendaba) Kumalo, son of Hlatshwayo of theNgoni tribe and his wife, Mquamache Nzima, was born near St. Lucia Bay in 1780 circa. Zongendaba, when a young man, appears to have shown great promise as a military leader. Hlatshwayo, his father, and Ziwide, uncle of his wife, Loziwawa Nqumayo, appear to have been close neighbours and friends, and with other local clans for some time resisted Tshaka. The date of Hlatshwayo’s death is not known, but Zongendaba broke away from the district or tribal area with a large following, after the second attack by Tshaka on the Ndwandwe Tribe, whom the Ngoni were assisting. Mzilikazi, a younger member of the Kumalo, after this defeat served Tshaka as an Induna for approximately two years, during which time his bravery and leadership, under the eye of Tshaka, brought him promotion. Zongendaba and Gwaza Tole broke away with a followingin the year 1823 ; Mzilikazi followed towards the end of the year 1825. In the same year, 1825, Soshangane, known as Manukusa, son of Sigode and a cousin of Zongendaba’s wives, Loziwawa and Sosera, broke away with a following of Ama~Ndwandwe and entered into Tongaland, Portuguese East Africa, through Swaziland. It is stated by native authorities that Zongendaba had with him girls and young women but no matrons, that they were few in number, that the Ama-Swazi were raided for cattle and suitable young girls, and that these were taken along with them on their northern migration through Tongaland and Lourenco Marques. It is definitely stated that the following wives accompanied Zongendaba from their tribal area: Loziwawa and Sosera. These women were daughters of Nombhengula, brother of Ziwide and son of Langa Vimba. Nombhengula was a brother of Ziwide and not as is sometimes stated a son. the Limpopo and Zambesi Rivers. In the year 1833, in which Manukusa attacked the Portuguese and drove them out of Espirito Santo (Lourenco Marques), Manukusa and Zongendaba disagreed and a fight took place, after which Zongendaba and his following, accompanied by Mhlabawadabuka, a brother of Manukusa, continued the migration north. In the following year, 1834, on the border of what is now S. Rhodesia, Zongendaba broke with Mhlabawadabuka and proceeded in a north-westerly direction, where at the Ingwe-Kwizi River he met the Ba-Lozi or Ba-Nyai, whom he destroyed; their chief, Mambo, was killed, some thirty miles from the battlefield at Intaba-Zi-Ka-Mambo. In November of the year 1835, at the time of an eclipse, a passage was found across the Ukwembe River (Zambesi) at Manyerere on the south bank, nearly opposite Zumbo othe north bank in Portuguese East Africa. At the crossing a dispute arose between Zongendaba and an induna, Ngabi Maseko, who with a small following remained on the south bank and, it is stated, crossed over the following year near Tete. Zongendaba, after crossing, halted for a period whilst his impis looted the surrounding country; his camp was built at Mkoko. About 1839 a movement in an easterly direction was made, it is said, by Gwaze Tole, who was a brother-in-law to Zongendaba and his Chief Councillor, because, acting on Zongendaba’s instructions, he had put to death one of Zongendaba’s wives for infidelity; Zongendaba followed. The direction was changed, after passing to the west of the present Fort Jameson, to a more northerly one passing the head-waters of the Bua River en route. In 1840 at Chulu, Mbelwa or Mombera was born, son of Zongendaba by his wife Umnene. Thence on to the Rukuru Valley. In 1842 Zongendaba arrived in the Fipa country, and the next two years were spent in raiding the surrounding country of the Sukuma and Msafwa. In 1845 Zongendaba died. It is stated that he had never seen or been seen by a European, that he was fierce with his soldiers and his wives who, on the least excuse, he put to death, that he was very kind and considerate to his captives, and that he listened to two men only, Gwaza Tole and Njekwane. He died at Mapupu in the Fipa country and was buried in a black ox skin near the Nyinaluzi River. On his death bed he gave his assegai to his eldest son and heir (by his Great Wife, Sosera), Ntutu Mpezeni, who was then in his twentieth year. (2) Loziwawa Nqumayo was the wife of Zongendaba-“ The Great Wife, Inkosikazi ”. She was born before the accession of Tshaka, about the year 1800, in the tribal area near St. Lucia Bay. She was Zongendaba’s “ great chosen wife ” and died during the great migration about 1833 ; her burial place is unknown. She died without issue. She was the eldest daughter of Nombhengula, who was a brother of Ziwide and Sigode, and a son of Langa Vimba Nqumayo. She was a cousin to Manukusa, son of Sigode, and to Nompetu, daughter of Ziwide, who married Matshobana, the father of Mzilikazi. Sometimes it happens that a great wife or other major wife is not blessed with children. In these cases another woman is placed in her “ house ” with the object of raising seed to it. The children resulting are looked upon as children of the establishment in which their mother was “ placed ” and are in the same position as if born to the major wife; the eldest son of a chief ’s “ Great Wife ” inherits the chieftainship of the tribe on the death of his father. This was, and is, the custom of the Ngoni; it is also known to the Achewa and Ansenga Tribes. This custom is known to the Ngoni as Nshlanze. Zongendaba therefore took as Nshlanze Sosera Nqumayo, a younger sister of Loziwawa, and by her he had issue as follows:- Ntutu Mpezeni, the eldest son, “the Inkosana of the Indhlunkulu,” Jadose, Mtwalalichi, and Ndhlobvu Makekevu. Sosera was born about 1808 near St. Lucia Bay. She migrated with the chief and followed him through all his wanderings until his death, after which she accompanied her son and heir, Ntutu Mpezeni, into what is now the Fort Jameson district. There she settled in her village called “Dingeni,” where she died in 1900 and was buried near the site of the old village of Mtenguleni Uka Sosera close to the Kakolo stream; her grave is now marked by an euphorbia tree. The site is on the farm owned by Major Jefferies, O.B.E., which prior to the invasion of the Ngoni used to be the land of the Achewa chief, Kampara. Sosera is well remembered by many natives who are living to-day, and although she died at a great age it is said that she was in possession of her full faculties until the las She is described as being a real chieftainess and it is said that in later years if annoyed by the younger generation she would lay about her with her mchiza (staff) in a lusty manner. Many amusing tales are told of her astuteness and dry humour. After Zongendaba’s death, Sosera chose for a very beautiful woman, named Nthonane, who was a young sister-wife to the house and who had borne no children, one, Sawaza Mazunko, as a seed raiser, for which he received twenty head of cattle. A daughter was born and named Ndawiri Jere; she now resides in the Fort Manning District of Nyasaland and from her this information was obtained. Ndawiri looked upon Ntutu Mpezeni as her brother, and Ndawiri was, and is, looked upon as one of Zongendaba’s children. She married Ndawombi, since dead, and has one son, Ndawombi Hara. It is agreed by the old indunas that Ntutu Mpezeni would have been about nine years of age when he crossed over the Zambesi, that he was carried across as befitted a Paramount Chief ’s heir, that, prior to the crossing, Zongendaba had given him a little shield and an assegai, and that he had killed his first duiker buck before the crossing. This is also borne out by the sons of Zimakazi Lavu Ngoma and Ngandu Mbawa, both of whose fathers were set the task of being servants to the chief ’s heir in his youth. Zimakazi Lavu Ngoma of the Ansenga tribe worked for Sosera when he was a youth. Zimakazi was caught and made a slave in 1835, the year of the crossing. Ngungu Ngoma, his son, has often heard this from his father and the chieftainess, Sosera. Zimakazi died a few years before his mistress. His son, Ngungu Ngoma, is in the N. Rhodesia Government Service and is about fifty years of age. (3) Chibenya Mkhalapi. This was the first wife of importance of Zongendaba, the ikohlwa wife. When Zongendaba’s mother, Mquamache Nzima, died, Chibenya was taken out of the chief’s house and put in his mother’s place and called “ the Great Mother.” This is a well-known custom amongst the Ngoni. The date of her death and place of burial are not known by the present day chiefs. It is stated by some of the indunas that she accompanied Zongendaba north and crossed the Zambesi in 1835, by others that she was the mother of Mtwalu, but this appears doubtful. (4) Gwaza Tole. Brother-in-law of Zongendaba; Chief Councillor and one of the great indunas. Tribe, Ngoni; regiment, Machaya Imiti. Father, Nzyekezera (Njekerezera) ; mother and wife, not known ; sons, Masakambewa and Chitete. Zongendaba had married one of Gwaza’s sisters. He appears to have been an elderly and very wise councillor, in whom the chief placed great trust and whose advice the indunas and captains readily accepted. Gwaza killed one of Zongendaba’s wives on his instructions, possibly his own sister. This led to ill feeling, and it is stated that Gwaza and certain others of his following kept apart from the chief after this affair. He diedat Fipa and was buried there in 1846. (5) Zulu Gama. Father, Njeru; mother, not known; wife, Nzyalisa. Zongendaba married a sister of Zulu Gama (possibly Mambose Gama) before the Zambesi crossing. They had no issue. On the upward trek after crossing the Zambesi River to the Fipa country, Zulu Gama left his wife, Nzyalisa, at a village near Kasitu ; she had a son by him named Paulos Gama, to whom Zulu Gama left villages at Luanjazi near Mzimba. After Zongendaba’s death, Zulu Gama and a following broke away, and were followed by the adherents of Mombera. A fight took place near what is now Old Langenburg, and Mombera’s people were scattered by this wily old induna. He crossed the Shire River in 1868. He entered Songea and died there later. Chief Ngabi Maseko was killed by Zulu Gama. Zulu Gama appears to have been a general of high qualities and a souncouncillor. (6) Njekwane Ntilila. Father, Mphange, a brother of Hlatshwayo ; mother, Manyuwazana ; wife, Mtonga Jojo; sons: Kapatamoyo I., Sondwani, Hoye Chafumela, Chulu, Mene, Mazwe. A cousin of Chief Zongendaba. Chief Induna of the Zimpofu regiment and Chief Induna of the Council. Died at Mpinduka Hill, Matambazi River, in the year 1868. (7) Mgai Kumalo. Father, Hlatshwayo; mother, unknown; wife, Bichi Nkhosi. Regiment, Majekwane. Died in the Ufipa country 1849. (8) Mguzhulu Mphanza ; one of the indunas of the Ziolomba Regiment. Crossed over the Zambesi in 1835. No further particulars known. (9) Ntabeni Kumalo ; half brother of Zongendaba. Father, Hlatshwayo ; mother, unknown ; wife, Uthuvi. Regiment, Ziolomba. Died and was buried in Ufipa Country in 1846. (10) Mafu Kumalo ; elder brother of Hlatshwayo. Father, Mangangati. Killed in action prior to arrival at the Zambesi. (11) Hlatshwayo Kumalo, the son of Mangangati of the Kumalo clan; married Mquamache Nzima. He had three brothers, Mafu, Gumete and Mphange. He was the father of Zongendaba, Ntabeni, Somfula, Mgai and Lomapela. I have been unable to ascertain if he took part in the Great Migration. My information leads me to the conclusion that he was dead before Tshaka vanquished the Ama-Ndwandwe. (12) Mtwalu Jere; born before the Crossing of the Zambesi, about 1833? Father, Zongendaba ; mother, Nqutu Nzima ; wife, Magodise ; sons, Amon Jere, and Yohane Jere. Regiment, Manyoka Masoko. Refused the chieftainship because he stated that his father’s, Chief Zongendaba’s, last wishes had not been carried out. There is no truth in the statement that he was unfitted to hold the chieftainship through physical defects. Died in Nyasaland (Angoni Land), 1890. (13) Mombera Jere (Mbelwa) ; born at Chulu on the way to Fipa, 1840. Mother, Umnene Nzima, a Swazi; father, Zongendaba; half-sister, Mphangela; blood sister, Lomagazi, who it is stated by some was born before the Zambesi was crossed; son, Chimtunga, whose mother was cast off because of adultery. Chimtunga’s appointment was not recognised by his grandfather’s indunas. Died in 1891, Angoni Land, Nyasaland. (14) Mperembe Jere. Not born north side of the Zambesi River; it is stated his mother did not cross the Zambesi in 1835. Mperembe went into the Awemba Country after the break up of the tribe, but appears to have crossed back eastwards over the Loangwa River and joined Mombera and Mtwalu about 1868/9, after being badly beaten by the Chitimukulu. It is known in the Mpezeni country that he captured Chanda mukulu, sister of Chitimukulu, whom he brought back with him and married at Mtelela village near theMulowi River, that he had one son by her named Chinombo, and that after the Ngoni rebellion Chanda mukulu was returned to her own country ; she resided on the Msekera River for some years. She had slits in her ears so large that one could put one’s hand through them. My informant, Sayeye Phiri, who was born at Kasitu, was caught by Mombera’s people at Kanyenda, Kotakota, and made a slave; she knew Mombera and Chanda mukulu well. She is well over seventy and resides in the Fort Jameson Location. Mperembe Jere appears to have been a disgruntled and bloodthirsty despot and to have had no interests other than bloodthirsty raids and the joys of his harem. He was a son of Zongendaba and died after Mombera. After Mombera’s death he was acting chief for some years until Chimtunga was appointed. (15) The following is a list of indunas and chiefs who crossed the Zambesi in November, 1835 :-Chief Zongendaba, Chief of the Ngoni. Chief Gwaza Tole, Chief Councillor. Chief Njekwane, Chief Military Induna. Indunas: Zulu Gama, Military Adviser ; Mguzhulu, Induna Ziolomba Regiment ; Somfula, Induna Somfula Regiment ; Mgai, Induna Majekwane Regiment ; Ntabeni, Induna Ziolomba Regiment. Chief Gwaza Tole was also Captain of the Machaya Imiti Regiment. Chief Njekwane was Captain of the Zimpofu Regiment. Regiments :-Majekwane, Ziolomba (black oxhide, White spot), Somfula, Machaya Imiti (red and black hide, white spots), Zimpofu. Wives of Zongendaba who crossed over :-Chibenya Mkhalapi, Great Mother; Sosera Nqumayo, Great Wife; Umnene Nzima, mother of Mombera; Nqutu Nzima, mother of Mtwalu ; Mavocho Mkhalapi, mother of Mzukuzuku? ; Chigomane, Nguluwe, Ndauya Mbanzima, Mambose Gama, Vuyakhazi, Mwachuma, slave wife and rain-maker? Daughters:- Lomagazi and Mphangela. Sister :-Qochiwe. A further list of Zongendaba’s Wives who may or may not have crossed over :- Nthomane, Bazyamanzya, Zin-Khabi, Nquaneleni, Nkhaleni, Nshanya, Mabeti. Brothers and half-brothers of the chiefs who crossed over :-Ntabeni, Mgai, Somfula, Mabuzyubuzyu, Ngoya, Unekwane, Uhallo, Ukhungwayo, Undina, Mtiyane, Lomapela. Chief Diviner or Isanusi :-Manyonkolo. (16) Zongendaba’s sons :-Ntutu Mpezeni, Mtwalu, Ndelendele, Mombera, Maulau, Mwalule, Mwamba, Makekevu Njobvu, Mperembe, Mzukuzuku (?) Kakuya, Jadose, Sikane, Chigamane, and others. (17) Chief Mpezeni Jere’s (Ntutu) wives :-Nyendeka Muzyopa, Athungwa tribe; Lupoko Phakati, mother of Tsingu Jere ; Chota ; Mtonga, mother of Madzimawe Jere ; Mtizwa Soko, Makalanga tribe; Mawase Soko, Makalanga tribe, mother of Mgwazu Jere; Maiwape Hara, Makalanga tribe ; Kukuya Twala, Swazi tribe ; Ntombiyimbi, First Wife. Eldest Son :-Tsingu Jere; married Nkuchwa. Both were shot in the Rebellion of 1898. Grandson :-Chiloa Mpezeni II ; married Augustina; heir, Pontilino. (18) Ntutu Mpezeni Jere was buried near the cattle kraal in Lupoko village near Fort Young, Fort Jameson District, in 1900. Lupoko, wife of Ntutu Mpezeni I and mother of Tsingu was buried near the cattle kraal in Lupoko village, in 1901. Tsingu Jere Was shot after court martial and buried near Chipinga old camp near Msesa Hill, 1898. Nkuchwa, wife of Tsingu Jere, shot by Lt. Poole’s troops in the Vubwi Valley; buried on the top of Nsaswe Hill, near Christie’s Farm, in 1898. Other Ngoni Regiments :-Mayunge (Ntutu Mpezeni’s regiment), Machihungu, Mavimba, Mahiza, Zinyoka, Masoho, Manyisa, Zinkondo, Machona, Mahora, Manyera, Mabema, Kambayenda, Mafelakudeni, Chimalilembalemba. (19) The isi-bongo, “Jere,” appears to have definitely not been used prior to the year 1835, and from information received it is extremely unlikely that it was in general use until after the death of Zongendaba. The chief isi-bongo up to that time appear to have been Kumalo, Nqumayo, Tole (said to be the eye of an ox), Nzima, Gama, Mkhalapi, Ndhlovu, and Nkosi. The isitakazelo now little used were Ndaba and Ntungwa. The language spoken by the Ngoni was closely allied to isi-swazi. The Paramount Chief, Mpezeni II, still receives the royal salute of “ Bayete ” on all official occasions and in his own home. (20) Ba-Pule people. It is stated that, when the Ngoni first met these people, they carried long spears and shields made of game hides, and they could converse with the Ngoni in isi-swazi, which was not the language of the Ba-Pule; when they spoke their own language they were not understood by the Ngoni. The general opinion of the old indunas is that they were BaSuto people. They supplied excellent fighting material to the Ngoni impis and were treated as equals. INTERESTING NOTE re DEATH OF LOBENGULA. Lobengula, Chief of the Ama-Tebele. It is stated as follows. Lobengula crossed the Zambesi at Manyerere Drift and arrived at the Mtenguleni Uka Sosera village on the Lutembwe River in January, 1894. He was carried by an Ngoni party who had been sent for that purpose. He was a very heavily built man with a large protruding belly, and breasts like those of a woman heavy in milk. So cumbersome was he, that he had to be helped to move about from one place to another. He had a great pipe in which he smoked hemp. If he passed the pipe he would talk, but if not it was a sign he wished to be alone. When Chief Mpezeni visited him he used to crawl on his hands and knees to greet him. The day Lobengula died the rock on the Sanjika Kopje split and fell and all the great Ngoni indunas mourned. Sanjika is on the road between Fort Jameson and Fort Manning. I have seen the split and fallen rock. It is not known where Lobengula was buried ; as he was a fugitive from justice, the secret was closely kept. It is said he died shortly after his arrival from the Zambesi in 1894. This information was given by an aged Ngoni councillor, named Ropu, who resided near Fort Jameson, and died in 1927. This story is but little known and usually all knowledge is denied of this subject. List of people who, being the oldest living Ngoni, attended a meeting held on Friday, Saturday, and Sunday, 18th, 19th and 20th of January, 1935, at the Paramount Chief’s village to discuss the history of Chief Zongendaba :-Bazaliyo Soko, Zamajaya Mphanza, Mshamunye Mphanza, Mshawa Mwase Shawa, Dede Tole, Mjobo Ndwambi Jere, Malwalaliche Tembo, Mzenje Nkhawa, Katenda Manynuny Makowane, Kapondela Joseni Mvula, Machilika Mphanza, Chhunguchane Nguluwe, Chiwere Maimisa, Maulau Jere, Mapulanga Mphanza, Chief Mpezeni Jere II, Chief Madzimawe, Andrew Kapatamoyo Jere, James Ndawambi Hara, Matrino Kangwere Nkhuwa, Penyani Mvula, Adriyano Phiri, Zebubabulo Gawani Mawere, Chingulukani Dimba, Siya Mvula, Ngungu Singu Jere, Mshawa Mphanza., Mezeki Lukhelo, Njombwa Tembo, Adonibezeke Mshanga, etc. TENTATIVE CHRONOLOGY OF THE NGONI TRIBE. 1590. Zumbo station on the Zambesi located by the Portuguese. 1760. Senzangakona born ; son of Jama and father of tshaka. 1770. Dingiswayo born ; chief of the Mtetwa tribe and son of Jobe. 1775 Ziwide born ; son of Langa of the Ndwandwe tribe. 1780 Zongendaba born ; son of Hlatshwayo of the Ngoni tribe. Zumbo Station opened and abandoned by Manoel G. Pereira. 1785. Tshaka born ; son of Senzangakona of the Zulu tribe. 1798. Mzilikazi born ; son of Mashobana of the Kumalo clan. 1800. Accession of Dingisvvayo. Loziwawa Nqumayo born ; daughter of Nombhcngula, the son of Ulanga Vimba. 1805. Tshaka took refuge with Dingiswayo. 1808. Sosera Nqumayo, sister of Loziwawa Nqumayo, born. 1810. Death of Senzangakona. Accession of Tshaka. 1812. Tshaka defeated the Ama Ngwana. Flight of Matiwane. 1817. Tshaka defeats the Ema Cunwini tribe. Flight of the tribe. 1818. Dingiswayo of the Mtetwa tribe killed by Ziwide. 1821. First attack by Tshaka on the Ndwandwe tribe. Nombhengula, brother of Ziwide, killed; father of Loziwawa and Sosera, wives of Chief Zongendaba; also of Nomahlanjana, Ziwide’s heir; Mpepa and Dayingubo his sons were killed. 1823. Sebetwane moves off With the Nati clan. Secession of Zongendaba and his indunas, after second Ndwandwe attack by Tshaka at Nkhandhla; Ziwide’s people beaten. Cattle and women seized by Tshaka and incorporated into the Zulu tribe. 1825. Secession of Mzilikazi, son of Matshobana, from Tshaka. Secession of Soschangane Manukusa, son of Sigode, younger son of Langa Vimba, Chief of the Ndwandwe tribe. Tribe vanquished by Chaka at Eldololwani Mountain between Mkuze and Pongolo Rivers. Death of Ziwide. Death of Sikunyana. 1826. Death of “Nada the Lily ” (Nandi), mother of Tshaka, widow of Senzangakona, and daughter of Mbengi, Chief of the Elangeni clan. Ntutu Mpezeni born; eldest son of Chief Zongendaba by his Great Wife’s (Loziwawa Nqumayo’s) Nshlanze and younger sister, Sosera Nqumayo). 1828. Zongendaba fought with Mzilikazi on the P.E. Africa Border, was beaten, and broke away into P.E. Africa near the Limpopo River, where he met and united himself with Manukusa and his brother, Mhlabawadabuka. Death of Tshaka. Death of Matiwane. 1829. David Hume visited Mzilikazi at Marico. Rev. Moffat visited Mzilikazi at Limpopo R. Lobengula born; son of Mzilikazi by his Swazi wife, Fulata, daughter of Chief Malendela of the Ama-Swazi. 1830. Dingaan’s impis iight Mzilikazi without result to either side. 1831. Mzilikazi at Thaba Bosigo; attacks the BaSuto, but without success. 1832. Mzilikazi at Mosega. Mtwalu born; son of Zongendaba by his wife, Nqutu, younger sister of Umnene. 1833. Manukusa defeated and drove the Portuguese from Espirito Santo (Lourenco Marques). Fight between Manukusa and Zongendaba. Zongendaba and Mhlabawadabuka left Manukusa and migrated in a northerly direction. Death of Loziwawa Nqumayo, Great Wife of Zongendaba. 1834. Mzilikazi at Kapaying. On what is now the S. Rhodesia-Portuguese (Mozambique) border, Zongendaba broke with Mhlabawadabuka, brother of Manukusa, and proceeded in a north~westerly direction Where he met the Ba-Lozi or Ba-Nyai. A fight took place at Ingwekwizi River where the latter were destroyed ; their chief, Mambo, was killed thirty miles from the battlefield at Intaba zi-Ka-Mambo. 1835. In November the Ngoni under the leadership of Chiefs Zongendaba and Gwaza crossed over the Ukwembe (Zambesi) River at the Manyerere Drift. Mgabi Maseko quarrelled and did not cross but travelled along the south bank and at a later date, 1836, crossed the river in the vicinity of Tete. The date of crossing was marked by an eclipse. 1836. Ngoni settled in the Ansenga country. Sofala plundered and destroyed by Manukusa.. Mzilikazi’s Matebele attack the Boers at Vechkop. Harris and others met Mzilikazi at Mosega. 1837. Chief Umtigana, Dingaan’s induna, fought with Mzilikazi and captured numerous cattle, but left an impi dead on the field. Mosega burnt out by the Boers. Mzilikazi moves out of the Transvaal. Fulata Swazi, wife of Chief Mzilikazi and daughter of the Swazi chief, Malendela, and Mother of “ Ningi ” and Lobengula, died near the Limpopo River. 1838. Bands of roving Ama-Swazi defeated and incorporated by Mzilikazi. 1840. Mombera (Mbelwa), son of Zongendaba by his Wife Umnene, born at Chulu, Nyasaland. Ngoni in the Rukuru Valley. 1842. Arrival of the Ngoni in the Ufipa country. 1845. Death of Zongendaba at Mapupu in the Ufipa country. Buried near the Nyinaluzi River. Break up of the Tribe. 1846. Death of Ntabeni in Ufipa country. 1847. Death of Gwaza Tole in Ufipa country. Northward trek of a body of Ngoni led by Mgai. 1848. Ngoni at Victoria Nyanza. 1849. Death of Mgai in Sukuma country. 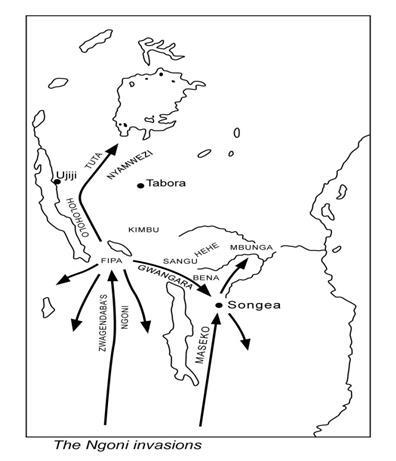 Zulu Gama and his people broke away into Songea. They were followed by Mombera’s adherents, who caught them up. Mombera’ people badly beaten; the fight took place near Old Langenburg. Mombera returned. 1850. Mpezeni and Mperembe break away and enter the Wiza and Wemba country. Mombera and Mtwalu move to the Henga country. 1855. Mombera’s Ngoni in the Tumbuka country in the vicinity of Hora Mountain. 1856. Mpezeni skirted the Wemba country on southward migration and raided Wiza and Lala tribes en route, east of Bangweulu. 1858. Death of Manukusa ; his son, Maweva, succeeds him. 1860. Mpezeni’s Ngoni at Cheronga on the Mchinga escarpment where an encampment was made, crops were grown, and local natives raided for slaves. Maweva defeated by Mzila, son of Manukusa. 1861.. Uloziba, Great Wife of Mzilikazi, died at Inyati, Oct. 5th, 1861. 1862. Zumbo Boma re-occupied by Albino Manuel Pachecho. 1865. Mpezeni’s Ngoni at Mkoma and Mbangombe Hills. Further encampment. Tsingu Jere born, son of Mpezeni Jere by his wife, Lupoko. 1868. Zula Gama crossed the Shire river, 5th September. Death of Chief Mzilikazi at Inyati. Mpezeni at Mpinduka Hill, Matambadzi Stream. Death of Induna Njekwane. Mperembe’s Ngoni defeated by the combined forces of Arab traders and Wemba near Chikumbo, Lake Bangweulu district. 1869. Mombera turned back, crossed the Luangwa river and joined Mtwalu and Mperembe in the Tumbuka country. 1870. Lobengula, son of Mzilikazi by his wife, Fulata, crowned King of the Ama-Tebele. 1873. Mpezeni at Mtenguleni-Uka-Sosera V. at the Lutembwe. R. Mpezeni at the Msipazi river. 1878. “ Ningi,” sister of Lobengula, murdered on an alleged charge of witchcraft, causing Lobengula's wife, Losekeyi, to have a still born child. 1880. Massacre of the Tumbuka on Hora Mountain by Mombera’s Ngoni. 1881. Mpezeni at Langeni Village. Visited by Carl Wiese. 1884. Death of Mzila, known to the Ngoni as Kaulandwa. 1889. Mpezeni visited by Sir Alfred Sharp. 1891. Death of Mombera. Chikusi, son of Mputa, deposed. Mperembe acting chief of Mombera’s Ngoni. 1893. Birth of Chiloa Mpezeni Jere, son of Tsingu Jere by his wife, Nkuchwa. Matebele War. 1894. Death of Lobengula Kumalo. 1895. Ngungunyana, King of the Aba-Gaza, deposed by the Portuguese. 1896. Matabele Rebellion. Defeat of Mwase at Kasungu by Alston and Swann. 1898. Mpezeni surrenders ; exiled to Fort Manning. Tsingu Jere captured and shot. Nkuchwa, his Wife, shot by Lt. Poole’s troop in the Vubwi Valley. Revolt ended. Fort Jameson established. 1900. Mpezeni I released and returned to his village. Death of Mpezeni I. Death of Sosera Nqumayo, mother of Ntutu Mpezeni Jere (Mpezeni I) and widow of Chief Zongendaba. 1901. Succession of Chiloa Mpezeni II (Jere). 1903. Chief Madzimawe claims the name of Zongendaba, but is refused by the Government. 1904. Death of Lupoko, wife of Mpezeni, at Lupoko village. 1925. Chiloa Mpezeni II present at the indaba given in honour of The Prince of Wales at Broken Hill, N. Rhodesia. 1934. The Paramount, Chiloa Mpezeni II, presented with his “ Staff of Office ” by Prince George at Livingstone, N. Rhodesia. 1935. Great meeting of old Ngoni chiefs with Paramount Chief, Mpezeni II, to discuss the chief ’s ancestors and the crossing of the Zambesi river in 1835. This being the Centenary. The Ngoni were well acquainted with native dug-outs (boats) beforethey left their tribal area which is now known as Northern Zululand.